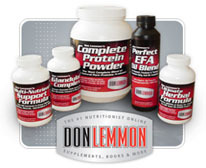 Nutritionist, Exercise Specialist, Health & Fitness Author, Weight Loss Expert, Don Lemmon. News regarding Essential Fats, Multi-Vitamins, Protein Powder, Fat Burners, Bodybuilding & Diet Tips. We expose myths, fads, lies and the truth about Bill Phillips, Suzanne Somers, Richard Simmons, Barry Sear, Dr. Atkins and other scams! 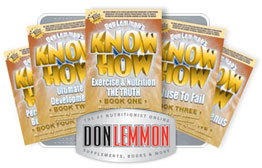 You are about to build a better body and mind with a nutritionist thousands of people have already turned to -- that'd be me, Hollywood's #1 nutritionist & best selling author, Don Lemmon. This is my official website and together, we have been exposing the TRUTH about exercise and nutrition since 1997. At this location, you will learn about things no one else teaches, my exclusive brand of nutritional supplements no one else carries, my various "Know How" books, and all of my other projects. What do I know about nutrition, fat loss, exercise, health, fitness, and bodybuilding routines that you don't? Plenty! Not only because I started off working in the medical industry, spent years training athletes and celebrities, but more so because I actually live and practice what I preach. If I weren't doing what I am right now, I would have become a physician somewhere in Southern California . Today, you know me as the #1 Nutritionist Online for a reason. I chose a different path than those who prefer to depend on drugs or perform unnecessary cosmetic surgery. Sure, it's brash, but some of you know me due to my work in rock music, magazine publishing, paperback novels, film scripts, or radio. You expected an upfront presentation -- here it is. This site is where we'll focus on why I'm considered one of the leading internet authorities on nutrition and exercise. Take a look at my clients; they are living, breathing, walking, and talking undeniable proof that you have come to the right place� and I know why you are here too� no, really. I do. For a long time, my insider's knowledge of how to easily manipulate the way your body works was kept a secret in Hollywood . I shared my KNOW HOW only when a celebrity wanted to lose fat fast and paid good money for the info. Now, I am talking to the masses and today, you are about to experience quite an eye opener. Take it from me, none of us can afford to ignore the way the body functions� and no amount of stomping your feet and insisting that the media propaganda you fell for says otherwise will change reality to suit you. No, I'm not a doctor, nor do I claim to be. I started off pursuing a future in medicine, but all the overweight patients our clinic worked with struck a nerve -- I changed paths. Trust me, learning the optimal workout and training with proper technique -- both definitely help, and I am willing to share the truth about all the exercise tricks you crave, but keep something else in mind: if exercise was the definitive answer to looking your best, there wouldn't be so many people slaving away in the gym for months at a time and getting nowhere. People, you simply must get your eating under control, discover the secrets to nutrition, and master them before starting a new workout plan. If you would just realize what you've read in magazines or seen on television is nothing more than carefully constructed propaganda meant to keep you from making progress so that you keep returning to buy the latest magic pill or powder, which -- in case you haven't noticed -- doesn't work either. Currently, I live in Utah with my wife, Asia Carrera. We live right near some of the world's most beautiful mountainside properties. I initially built my following as a Los Angeles , California based trainer, then author, radio show host, television personality, etc. -- I have worked hard to get where I am right now. Let me tell you, this does not make us all that very different. Just like you, I have other interests than food, jobs that aren't in the nutrition industry, or living on the beach. I come from a small town in Ohio known as Newton Falls and I've put my time in at minimum wage jobs to learn the ropes. The point is that I never quit, so it doesn't matter where you come from or what you do in order to look your best or strive for more in life, nor does it matter what diet you follow or where your beliefs lie when it comes to eating right. We all just want to look good and we don't want to sacrifice our lifestyle or lack in the other entertaining aspects of our lives to do so either -- I know this, you know this, and I will teach you how. Still, many people have come to this website and wondered why I set out to discredit those who are apparently my competition instead of just stating my case. It's because I am stating my case! I grew tired of being lied to by the media and sucked in again and again only to be let down by the hype of yet another fat burning or muscle building product. Where would any of us be if someone didn't point out where these companies have misled us? When you look at your legs, your back side, or your belly, and something is bigger than you want it to be, or if your muscles do not look like what you would expect and even though you are exercising and popping super pills -- sometimes A LOT -- do you really think for a second it isn't your eating habits that caused this downslide in your appearance? Trust me, it is, and no, those magic supplements are not suddenly going to begin working either. It's food -- your selections aren't what they should be even if you buy everything organic or at a health food store. I am not implying everyone eats junk food, but some of the things you think are good for you really aren't and you can tell what's bad by what doesn't digest correctly. It can be things like burgers, fries, meal replacements, or anything else that gives you gas (again with organic foods) or makes you burp is another sign of IN-digestion (sodas, shakes). If something causes indigestion, it won't nourish you properly even if you look outwardly �okay� or �better� than before. No, taking vitamins and enzymes aren't enough (supplements don't work unless the diet is correct either). "IN" is the same as "UN" or IN-complete and UN-digested -- we both know why you are here. It's to look and feel better. The �feel� part is important because you can feel when something is not right... something inside is telling you. What you are doing now, like it or not, is slowly destroying you inside... sooner or later, your bad habits will catch up to you. This is why people eventually turn themselves onto �health food crazes,� but it's always after they get older and fat... it isn't just a phase people go through -- we get scared to death of death! Some things just don't work like they used to after we've spent years abusing ourselves. Like a car, run yours up hill too often without proper fuel, cleaning filters, or other maintenance and� well, see how long that car lasts you, high performance or not. This is also the reason why people end up with high cholesterol, diabetes, unsightly cellulite, ulcers, and other ailments: their PAST SOURCES of FUEL and improper living has caught up. You're getting rusty, deteriorated, faulty� it doesn't have to be like this. No, drugs, like Lipitor, are NOT the remedy for when diet and exercise fails regardless of the ad's claim for lowering your cholesterol. YOU control YOUR cholesterol. And no, changing workouts will not cure the ailment; exercise doesn't fail YOU, YOU fail YOU with your eating and nourishment. Today is your lucky day because now you have a chance to learn to do it all for yourself and push all the marketing, lies, and hype aside. You will discover how to make the easiest of lifestyle changes -- forget about what you think you know.